I have been thinking about a cassoulet for months. A real cassoulet – with duck confit and everything. Today, I made my cassoulet! 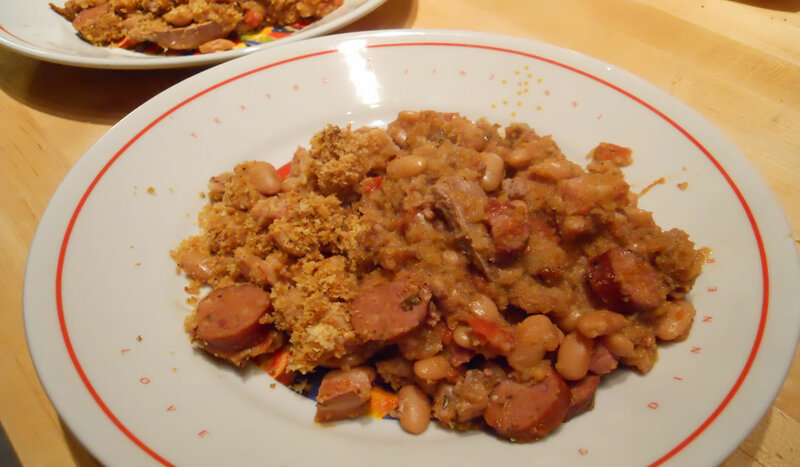 In its most base form, a cassoulet is French baked beans. But – in true French style – the lowly bean is elevated to dizzying gastronomical heights. It is a treat, indeed. There are probably as many recipes for cassoulet in France as there are ravioli in Italy, so I didn’t feel the need to strictly follow any one recipe. I went for a bit more technique than strict ingredients, but the end result was just fine. But parsley or no, it came out just fine. Cover beans with cold water by 2 inches in a large bowl and soak 8 to 12 hours. Drain in a colander. Transfer beans to a 6- to 8-quart pot and bring to a boil with 8 cups cold water, broth, tomato paste, onion, and 2 tablespoons garlic. Put celery, thyme, bay leaf, cloves, parsley sprigs, and peppercorns in cheesecloth and tie into a bundle with string to make a bouquet garni. Add bouquet garni to beans, then reduce heat and simmer, uncovered, until beans are almost tender, 45 minutes to 1 hour. Stir in tomatoes with juice and simmer until beans are just tender, about 15 minutes more. Remove all skin and fat from duck legs and cut skin and fat into 1/2-inch pieces. Separate duck meat from bones, leaving it in large pieces, and transfer meat to a bowl. Add bones to bean pot. Brown sausage in batches in fat in skillet, then transfer to bowl with duck meat, reserving skillet. Add remaining tablespoon garlic to fat in skillet and cook over moderate heat, stirring, 1 minute. Stir in bread crumbs and cook, stirring, until pale golden, about 2 minutes. Remove from heat and stir in chopped parsley, 1/2 teaspoon salt, 1/4 teaspoon pepper, and cracklings. Remove bouquet garni and duck bones from beans and discard, then stir in kielbasa, duck meat, remaining teaspoon salt, and remaining 1/4 teaspoon pepper. Ladle cassoulet into casserole dish, distributing meat and beans evenly. (Meat and beans should be level with liquid; if they are submerged, ladle excess liquid back into pot and boil until reduced, then pour back into casserole dish.) Spread bread crumb topping evenly over cassoulet and bake, uncovered, in lower third of oven, until bubbling and crust is golden, about 1 hour. It really worked on every level. Rich, flavorful, creamy, meaty, and filling. I was surprised at just how much duck meat was on that one leg and I still got a fair amount of cracklin’s for the bread crumbs. More would have been nice – but what I had worked. And a big cassoulet called for a fresh loaf of bread. 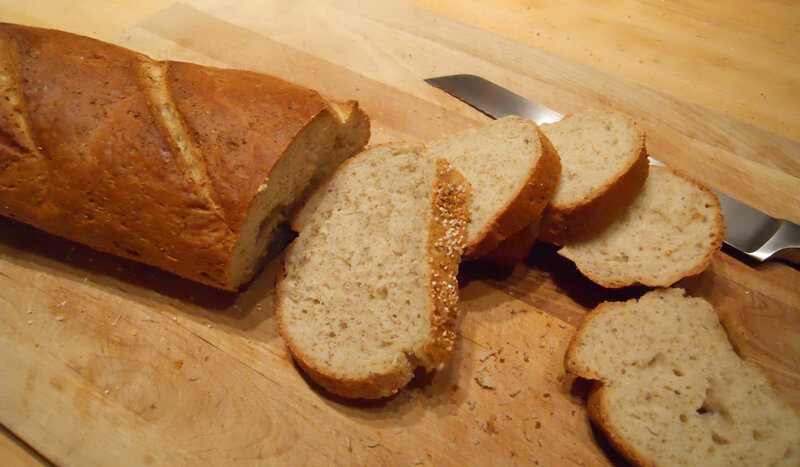 I went to my lazy-man’s loaf – James Beard’s French Loaf – his Cuban bread. I tweaked it a bit and added a bit of rye flour . Came out excellent! His original recipe makes two loaves. I cut it down for one. Combine the yeast with sugar and warm water in a large bowl and allow to proof. Mix the salt with the flour and add to the yeast mixture, a cup at a time, until you have a stiff dough. Remove to a lightly floured board and knead until no longer sticky, about 10 minutes, adding flour as necessary. Place in a buttered bowl and turn to coat the surface with butter. Cover and let rise in a warm place until doubled in bulk, 1½ to 2 hours. Punch down the dough. 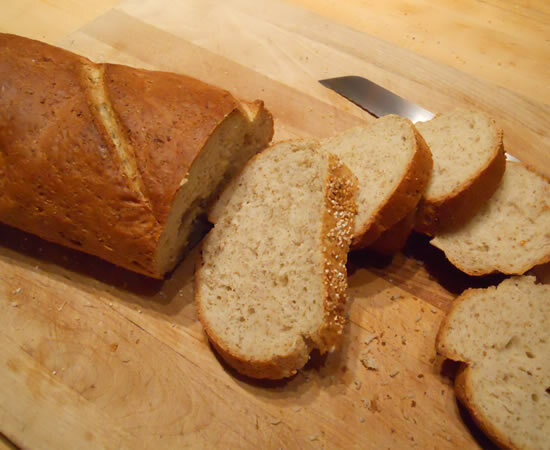 Turn out on a floured board and shape into a long, French bread-style loaf. Place on a baking sheet that has been sprinkled with the cornmeal but not buttered. Slash the tops of the loaf diagonally in two or three places, and brush with the egg wash. Place in a cold oven, set the temperature at 400°, and bake 35 minutes, or until well browned and hollow sounding when the top is rapped. I do have to admit that we ate well, tonight.